As the S&P 500 continues its longest rally on record, the next recession is coming sooner than we think, according to a recent article by Forbes. Until Wednesday when the S&P nosedived 94 points along with the rest of the markets, investors mostly shrugged off trade disputes, rising oil prices and $200 billion worth of additional tariffs on China. Forbes cited three indicators other than relying on just equity market signals. 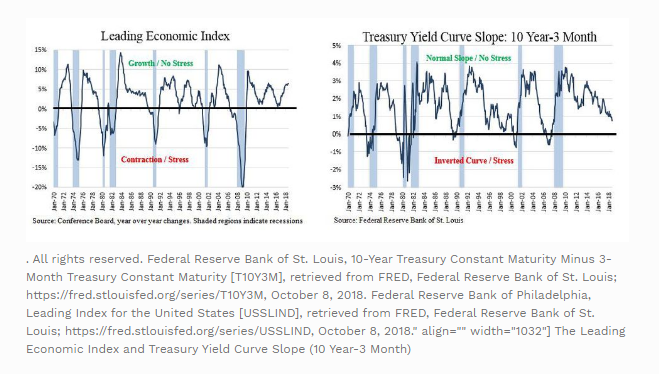 Shown simultaneously, these three indicators signaled the last seven recessions about five to six months ahead of the crash by integrating the interplay of the business cycle, market dynamics and monetary policy. Changes in the Conference Board’s Leading Economic Index (LEI) captures the pulse of the business cycle, a strong indicator of economic health. The Shrinking spread between the 10-year and the 3-month Treasury rate, especially when it inverts. Tracking how far the Fed Funds rate is above or below the neutral rate. 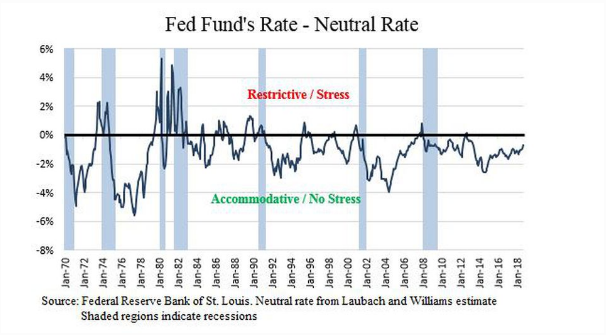 If the Fed Funds rate exceeds neutral, it will slow growth and trigger a recession. Given the current levels of LEI (below), the yield curve slope and the Fed stance, it looks like the next recession won’t hit until well into 2020. But divining recessions is difficult and investors shouldn’t ignore that geopolitical tensions could derail economic growth sooner than expected. Domestic weakness are amplified by negative exogenous shocks, weakening economies, and the ongoing trade disputes and the risk of rising oil prices are significant threats markets have mostly been shrugging off. But that should change the longer the U.S.-China dispute wages on. The fear, according to Forbes, is China will eventually will start enacting penalties on U.S. companies based in China, boycotting U.S. products or withholding essential products to disrupt production. The longer the tariffs are in effect, the more likely inflation will become a serious problem, forcing the Fed to continue raising its interest rate. The U.S.-Iran situation is another geopolitical risk that will likely cause gas prices to rise even further. Iran can also disrupt Iraq’s oil supply and interfere in regional shipping, and the combination of a restrictive Fed and lower oil supply can usher in a recession. The U.S. could also overplay its hand with China. The heavy handedness the Trump administration used to renegotiate NAFTA won’t work with China.